Working with hundreds of advisors on social media marketing we’ve come to learn a few things and we get asked a lot of questions. One question we’re asked a lot is “what type of content so I share on social media?” Valid question! When diving into the social media pool it’s important to remember that your audiences on each channel are going to be different. Which also means the content you share may be different across each channel – and that’s okay. Before we get started, be sure to follow us on social media by clicking the icons below! For example, if you take a look at the Twenty Over Ten Twitter and LinkedIn accounts, you’ll see that we post completely different things on each platform. But how do we decide what to share on which platform? 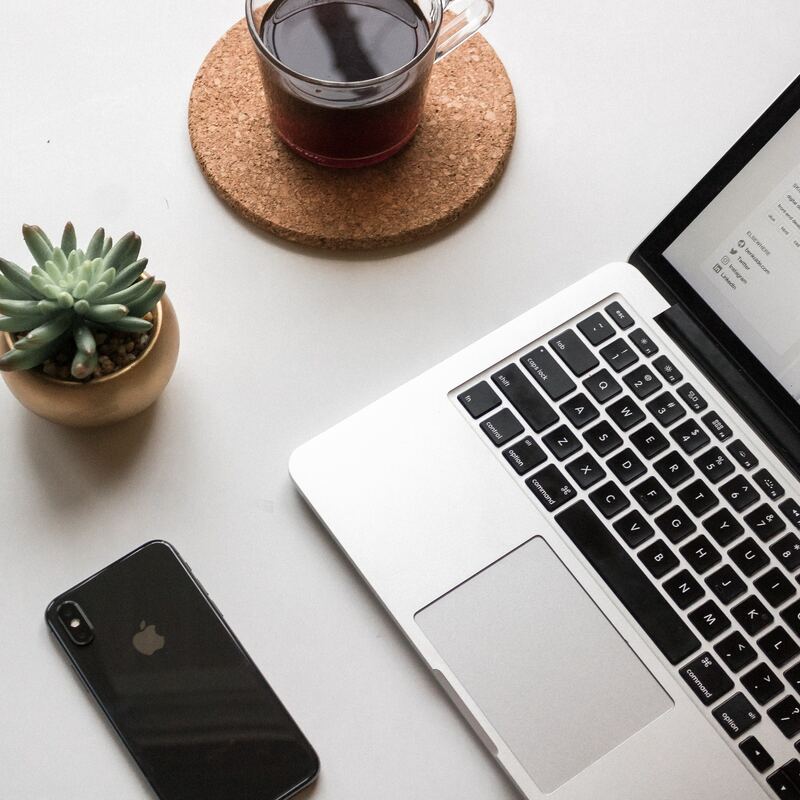 Read on to learn exactly what types of content you should be sharing across popular social media platforms like Twitter, Facebook, and LinkedIn. The majority of advisors we work with at Twenty Over Ten with are now most familiar with this social media platform – Facebook. Maybe you’ve had a personal Facebook page for some years now but you’ve never dabbled in it from a business/company perspective. They are very different. As a brand on Facebook it’s important to pay attention to what your audience likes and gravitates towards or engages well with. Recent studies show that video is far outperforming images on Facebook. Garnering an average organic reach of 8.7% using video in your Facebook posts is a top performing. Additionally, the amount of video from people and brands on Facebook has increased by 94% and is averaging more than 1 billion video views per day. 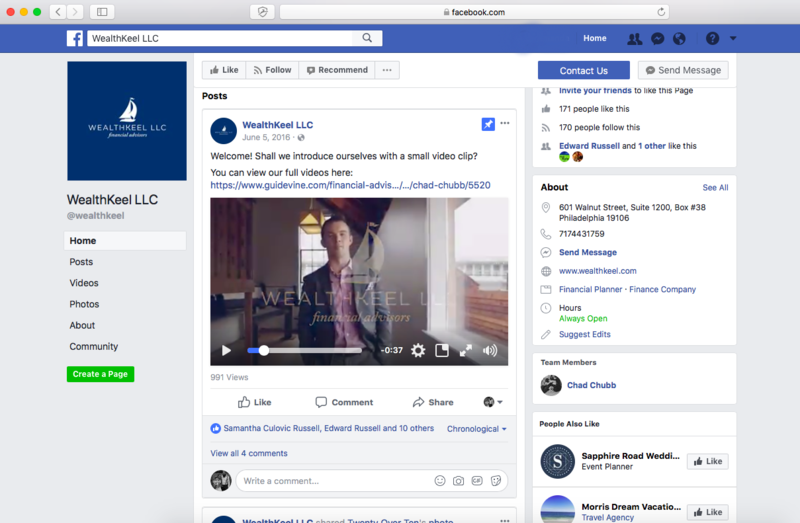 Twenty Over Ten client, Wealth Keel LLC, uses videos on their Facebook page to increase engagement. Post shorter, more timely video content: With the majority of users visiting social channels on their mobile devices, post videos that are intriguing and will pull people in from the first frame. Opt for no sound: Auto-play videos in Facebook specifically are automatically muted. So until someone taps to unmute they will not hear any sound. So your video should capture attention without the use of sound. This is a no-brainer. You should always share your blog posts on your Facebook page. However, it’s important to keep in mind the 80/20 rule for social media, which is this: share only 20% of your own brand’s content and 80% of “other” interesting content. When sharing your blog posts on Facebook include a creative snippet of what the article is about and a canva to accompany it along with a link to the blog post on your website. 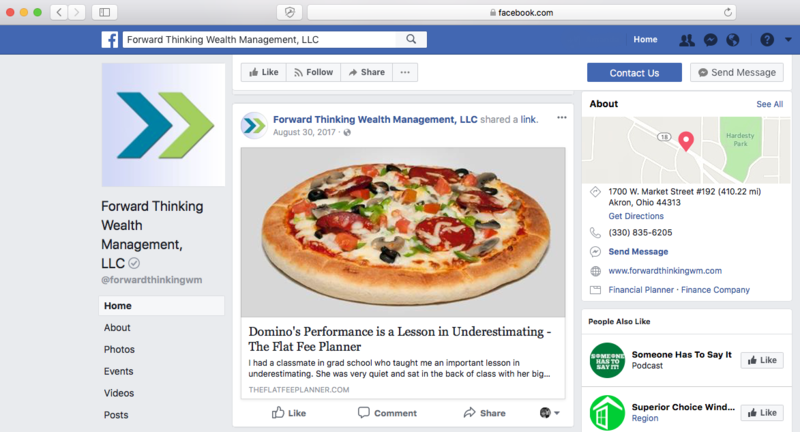 Twenty Over Ten client, Forward Thinking Wealth Management, shares an article from their blog to their Facebook page. After all, Facebook is just one big online community. Facebook is the perfect platform to post about events and other happenings going on in your local community, wether your participating or not. It is an especially great tool to leverage if you are hosting an event yourself it’s a great outlet to promote your seminar, workshop, etc. 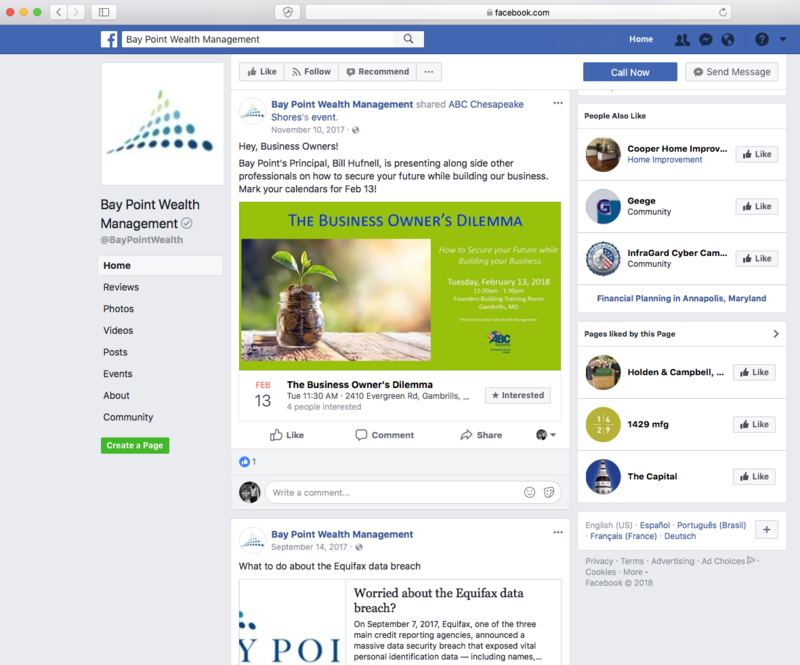 Twenty Over Ten client, Bay Point Wealth Management, leverage Facebook events to promote a speaking event. The financial services industry is one where transparency is everything. What a better way to be transparent about the work you do than posting behind-the-scenes photos of your office, team members and work life? Posting more candid pictures like this allows your clients and prospects to get to know more about you and create brand loyalty. 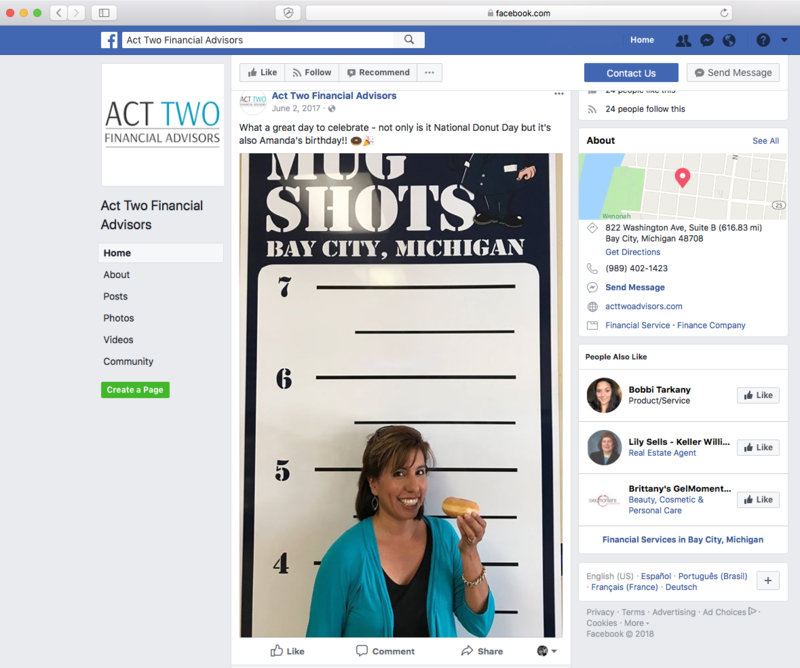 Twenty Over Ten client, Act Two Financial Advisors, shares a fun behind-the-scenes team member picture. Launching polls on Facebook isn’t something we’ve seen advisors do a lot of but it is something that encourages a ton of engagement among followers. Not only do these types of posts increase engagement but they are also somewhat of a mini survey for clients and prospects. Asking questions is a good way to gauge your audience’s interest or knowledge on a particular financial planning topic if your considering launching a new service, tool, workshop, etc. 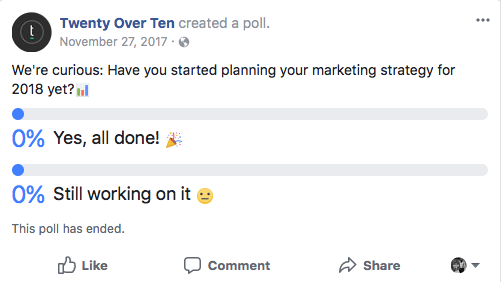 We launched a poll on the Twenty Over Ten Facebook page asking our audience about their marketing strategies for the New Year. As we see some social media channels like Facebook moving more and more towards paid advertising for businesses, Twitter has become one of the easier social platforms for advisors to use. And as long you’re doing it right, Twitter provides businesses with a ton of great organic value. Social media is a lot about positioning yourself as an expert in the industry. And by sharing relevant third-party and other industry articles you are doing just that – you’re showing followers that you are on top of trends and remain a thought leader in the space. 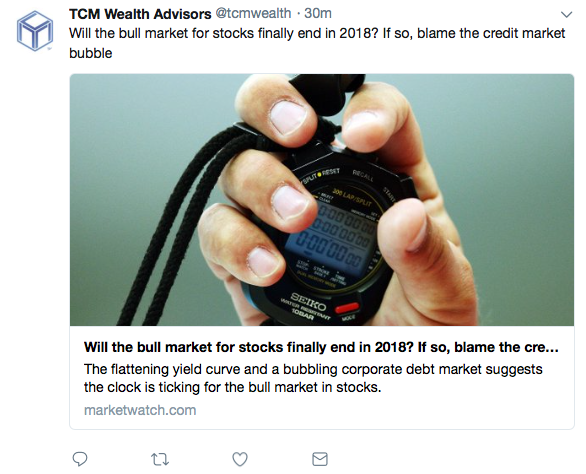 Twenty Over Ten client, TCM Wealth Advisors, shares an article from marketwatch.com on it’s Twitter page. Retweeting and other forms of interacting with those you follow on Twitter is a great way to build and strengthen relationships with key partners and show appreciation for the work they do. Consider retweeting articles that align with your business values that will be impactful to those who follow you on Twitter. Remember that when you’re retweeting, replying and mentioning others on Twitter anyone can these since it reflects on your business, it’s important to be responsive and avoid long exchanges. Twenty Over Ten client, Forefront Wealth Partners, mentions partners in a tweet about an upcoming event. Seeing a trend here? Yes, your blog posts should virtually be shared everywhere and anywhere you can share them. Why? Because they drive traffic back to your website👍 Again, we recommend creating a canva to go along with a short snippet of what your blog post is about in addition to the link. 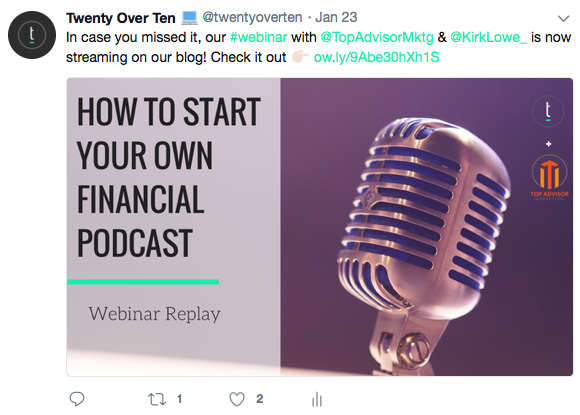 Twenty Over Ten tweets about a recent blog post featuring a webinar replay. LinkedIn can get a bad rep for it’s more formal “black tie” feel. However, it’s an incredibly important platform for financial advisors to have a presence on. It’s likely that most of your LinkedIn connections are going to more business-oriented (i.e. clients, peers, sales managers, etc.) so it’s important to stick to content that appeals to those professional interests. Searching for inspirational quotes can be a break from the mundane. Pick and choose quotes that either hold a special meaning for you personally, or one that relates to your business/niche specifically perhaps from another industry thought leader. 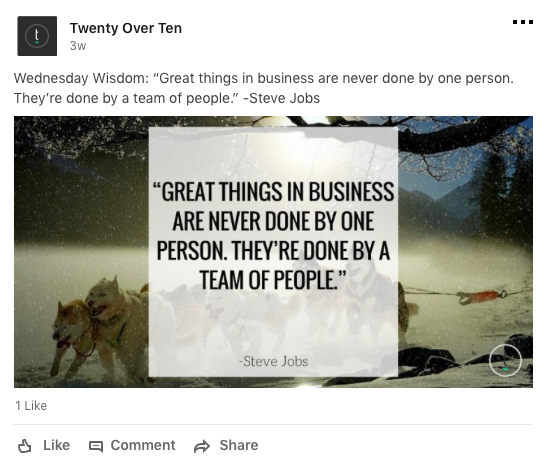 At Twenty Over Ten we make #WednesdayWisdom posts every Wednesday with inspirational quotes that are mostly design, business and team oriented. Similar to Twitter, LinkedIn is a great platform to share other third-party articles with your connections. Remember – the 80/20 rule still applies here. However, stick to third-party articles that are focused on financial planning to garner better engagement with your connections. 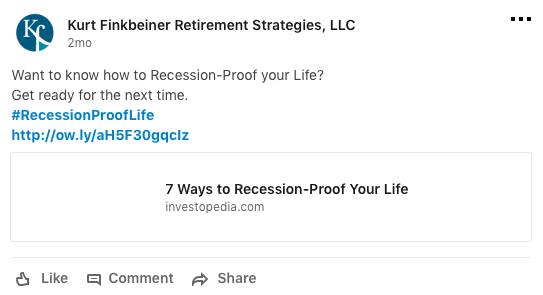 Twenty Over Ten client, Finkbeiner Retirement Strategies, shares third-party articles from Investopedia on his company LinkedIn page. Your LinkedIn profile is a great avenue for clients and prospects as well as potential hires to learn more about your company’s culture, achievements, and other happenings around the office. According to LinkedIn, images “generally result in a 98% higher comment rate,” so consider including images along with your business-related announcements. 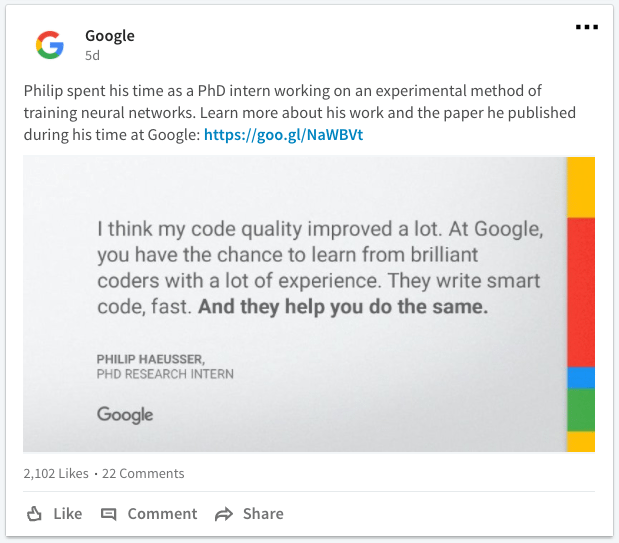 Google does a great job posting business-related announcements to their LinkedIn page such as this team member experience post. 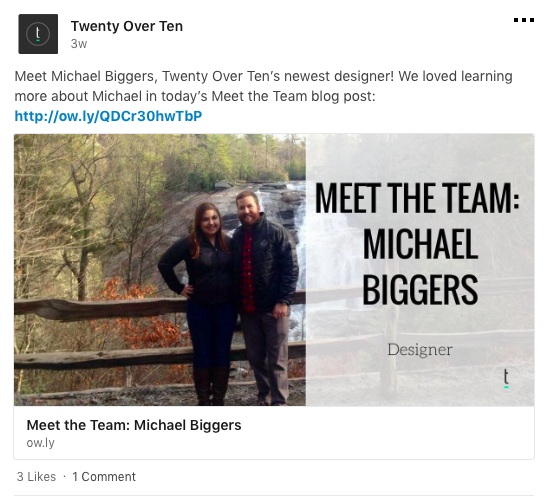 Twenty Over Ten’s meet the team series gives followers an inside look at our team members. Above all else, before you start posting to any social media channel ask yourself this: “is what I’m sharing useful, informative, entertaining, interesting, and will it help my audience better connect with me and my brand?” If the answer is yes then happy posting! What’s the Best Social Media Scheduling App For Your Business? Need Help Getting Your Firm Setup on Social Media? With our social media starter package, we’ll work with you to develop a cohesive social media presence from one platform to the next.